Undeniably, pressure cookers are some of the most useful upgrades you could make to your kitchen, with their signature taste, health benefits and immense speed, and they aren’t even particularly expensive, cumbersome or hard to get! And to prove just how much of a no-brainer it is getting one, we’ve assembled an overview of some of the most popular models of one of the most popular pressure cooker manufacturers, Cuisinart. Ready to make an upgrade, then? Here are highly rated electric cookers from Cuisinart below. The CPC-600, as the name implies, can contain up to 6 quarts of nearly any meal at your disposal, and can cook, bake, brown or sauté it as quickly and efficiently as the current state of the art allows. All of its admittedly expansive feature set can be accessed via the neat capacitive-touch console, which is mounted right front and center, easy to reach. For comfort and convenience, there’s a handy mix of exposed aluminum, chrome and cool-to-the-touch dark plastic surfaces. Preparing any kind of dish is not only child’s play, but very fast, too, which explains why the Cuisinart’s built-in digital timer only goes up to 99 minutes. Just to drive the point of the device’s versatility home to the fullest, Cuisinart even includes a pretty lengthy recipe book with the CPC-600. As a 1000-Watt, 6-quart unit, it sits right in the midfield of pressure cookers in terms of both size and energy consumption, which makes it very suitable for its role as an all-round, daily usable device that can go anywhere, a jack of all trades so to speak. Price-wise, it manages to stay pretty competitive at $75. However, those looking for a truly range-topping device will have to pay up inevitably; the CPC-600 isn’t meant to wow crowds, it just gets its job done. So, if bells and whistles are what you fancy in an appliance, you may want to look at some of Cuisinart’s higher-end offerings. 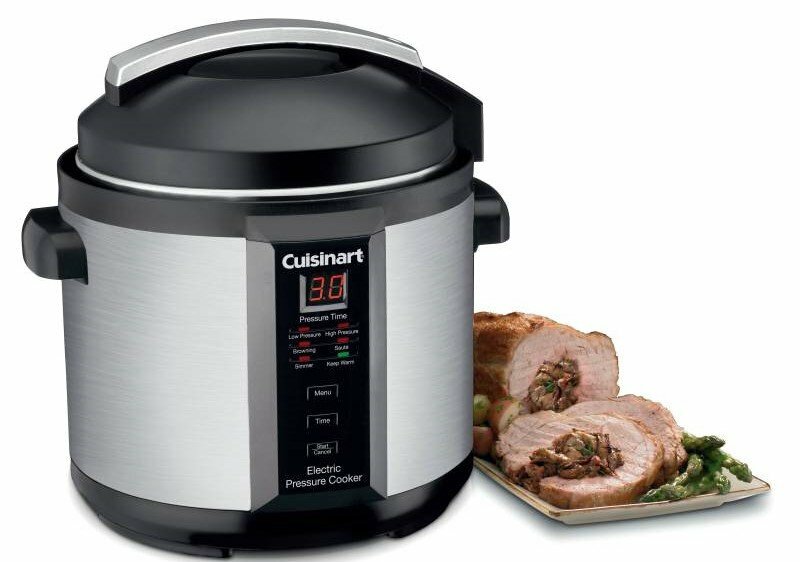 Performing admirably in nearly every single discipline of cooking goodness we could think up, the CPC-600 by Cuisinart deserves to be called one of the best, most budget-friendly compact pressure cookers currently on the market. It’s easy, it’s simple, it fits anywhere, and it will get your food done fast, no problem. What more could you want? When we talked about some buyers perchance being disappointed by the CPC-600 model’s lack of extravagance and its rather down-to-earth features and packaging, we weren’t fooling around. Yes, you really can gadget-ify everything nowadays, even pressure cookers, and the MSC-600 is clear proof of that. Here we have a pressure cooker with the exact same 6-quart capacity as the CPC (though an upgrade to 8 quarts is optionally available at a surcharge) and the exact same basic components out of the box that yet costs nearly four times as much brand new! Okay, perhaps that is an exaggeration of sorts; yes, Cuisinart really did release the MSC-600 for an outrageous $300, but that was over three years ago. Nowadays, you can pick one up for a cool $110, give or take a dozen. But, what is the MSC-600, really? Just a bigger, badder, more beefed-up version of the regular CPC? Not quite. 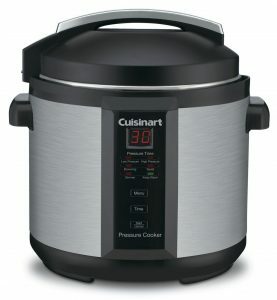 You see, Cuisinart brands the MSC as a ‘Universal Kitchen Appliance’, and the reason for that is that, it combines all the pressure cooking features of the CPC line with regular slow cooking and multi cooking tech, or so they say. It’s three devices in one! Sort of! Truth be told, the vast majority of what you get with the MSC, you can get on any other pressure cooker. 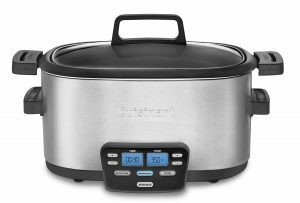 There’s nothing particularly amazing about its tech or the way it implements it—just a standard pressure cooker model slightly upgraded with some slow cooker-like options and modes. So, even though it may be luxurious, well-made, expensive and feature-packed, not to mention practical, truly innovative the MSC is not. So, if you’re looking for a truly De Luxe kitchen appliance, this would probably have to be it. Few others cram this much into such a compact shape, and even fewer do it with this much grace, efficiency and value. For aficionados who really care about every detail, the MSC is a safe bet. We hope you enjoyed this wild ride of ours through the world of pressure cooking! Whether you’re already using a Cuisinart or similar device or you’re planning on buying one in the near future, we designed our overview to be as accommodating as possible, so that everyone can sit down, read some and have a laugh. Perhaps learn a thing or two if they’re really lucky. That’s all for this time, folks! Stay tuned for more!